Who Can Sue After a Wisconsin Dog Bite? | Hupy and Abraham, S.C.
Do I have the right to sue someone after a Wisconsin dog bite? Wisconsin, like other states, has laws about who can bring a lawsuit. These laws establish who has standing to sue. Anyone can file a complaint in state court. However, if you do not have the legal authority—known as standing—to bring a lawsuit, then the defendant will quickly raise that issue and seek to have the case dismissed. The court will grant that motion to dismiss and you will not be able to recover damages. Thus, before you go through the effort of filing a dog bite lawsuit it is important to know whether you have standing. You were injured and you are age 18 or older. Adults who have been physically hurt by someone else’s dog have the legal right to seek compensation in court. You are the parent or guardian of a minor child who was hurt. Children do not have the legal authority to start lawsuits in Wisconsin. However, you have the right to act in the best interests of your child by bringing a lawsuit on your child’s behalf so that your child can recover damages for his injuries. You are the legal guardian of an adult who was wounded. Adults who have legal guardians may rely on their guardians to bring a lawsuit and seek fair compensation after a dog bite injury. You are the executor or administrator of a person’s estate. If the person died as a result of dog bite injuries, then you may have the right to bring a wrongful death lawsuit on behalf of the estate. The injuries that were suffered must include physical injuries and may also include emotional injuries. Once you know that you have standing, you need to know how to protect your rights. You will need to take action in order to get fair damages for the injuries that you suffered. This may include filing a dog bite lawsuit. 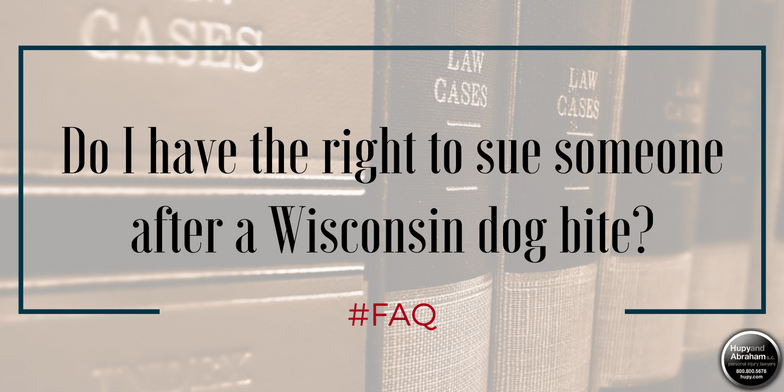 To find out more about how Wisconsin dog bite cases work or about how to protect your rights and fair recovery, please start a live chat with us at any time.